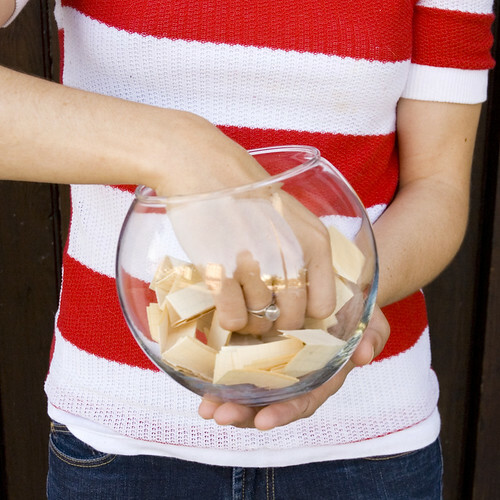 phew-- choosing the winners was quite a venture. i had it worked out in my head that i would just cut and paste the comments into textedit and print them out and number them, so that i wouldn't have to count to 300 or above eleven times (i would have lost count several times and ended up re-counting about one million times). that didn't work, because when i tried to cut & paste, it pasted the photos also, and would have been either a ton of work to cut and paste each one individually, or waste about 60 sheets of paper and a whole lot of ink printing all those pages. i decided to write out a list of all of the names, which even though it may seem silly to write over three hundred names, it worked out well. a handful of folks accidentally posted their comments twice, so to this method ended up making things a bit more fair for everyone, because i did not count the repeated comments. then i broke out my trusty iphone and used a randomizer to choose the eleven lucky W I N N E R S !!! congratulations to: miss priss/morgan, ashley, claire madden, siobhan, grrfeisty, karen, karen barbé, brooke @ clairemontroad, lover mother, jessica jane, and chuck ! ! ! does anyone have any suggestions for an easier method for choosing giveaway winners? any help would be greatly appreciated. thank you all for your comments and support. xo, hank. All you do is type in the number of comments you got and it picks a random number for you! and i hope i'm the ashley who won!! hi katie, i've just come over from jessica jane's blog after seeing your beautiful package from the giveaway she won. i love your designs!!! !